Used book stores in Argentina are a hit-or-miss proposition when it comes to books in English. On one hand, since most people are much more proficient in Spanish, a lot of places don’t bother to have a decent stock of books in other languages but on the other, since Argentina is way off the beaten path of English-language collecting (it’s not Hay-on-Wye by any stretch of the imagination) and since there was a huge influx of immigration from Britain in the second half of the nineteenth century and first half of the twentieth, it’s still possible to find interesting and odd (as opposed to valuable) books in the piles. One of my more recent discoveries is a book of essays entitled The Book of Speed (the one in the image isn’t my copy–mine is moth-eaten and ragged and the dust jacket is long gone). This one is a compilation of essays by notable celebrities of the time, including men who broke the land and water speed records, such as Malcolm Campbell and George Eyston) and airplane manufacturer Geoffrey de Havilland (paternal cousin of Olivia, who acted in the screen adaptation of Gone with the Wind and countless other films). But the true fascination is that the book was compiled in 1934, which comes through beautifully in several aspects. The most notable, perhaps, is the innocence with which German vehicles such as the Do.X flying boat are describes as technical marvels by this British book. The second is the style of writing, in which the British Empire is still a palpable character and in which there is a delightful mix among the men writing the book. Some are military, some are from the aristocracy, and some have pulled themselves into the text by their bootstraps–but all are treated equally as experts in their field. It was a time of transitions, but one where the old ways were still alive and well. It’s extremely easy to see, just from reading this book, why the loss of Empire hit Britain so hard: the way of life that was lost truly did have some exceptional qualities that modern life can’t begin to approach. That glory of living, the gusto for human advancement comes through loud and clear, but it isn’t the central tenet of this book. That would be the search for going ever faster and, ironically, destroying the leisurely pace of life they don’t even know they’re celebrating. Unbeknownst to them, and unlike other books that serve as an elegy to the same era, the authors of this book are describing the very things that ended the way of life they’re talking about. Speed is everywhere: on land, in the air, on the water. Trains, planes, automobiles, ocean liners, war boats, Zeppelins–each has its place in the text. And the photos serve as a fascinating backdrop. Most pictures from this time period are either of war (especially things like the Spanish Civil War) or of the buildup to war, so seeing the civilian side is amazing. It’s certainly worth the fifteen dollars or so a demolished copy would set you back on ebay. If you want a high-quality example, you may need to budget many times that. Gustavo Bondoni is an Argentine author whose most popular book is the far-future novel Siege. You can check it out here. Painting with all the colours of the wind, USN airships created tragic landscapes. Today marks the return of our most prolific contributor: Stacy Danielle Stephens. She’s the author of our beloved article on the Hindenburg and this time, she’s discussing airships built in the US. Launched in August, 1923, USS Shenandoah was moored at Lakehurst on January 16th, 1924, awaiting the approach of bad weather, to test how well it could tolerate high winds. The crew and command staff soon realized this was a bad idea; the ship was preparing to cast off and flee the storm when a 78mph wind removed the covering of a tail fin, rolled the ship, then tore it loose from the mast, rupturing the first forward gas cell and perforating the second. The ship departed Lakehurst backwards, helpless in the wind. 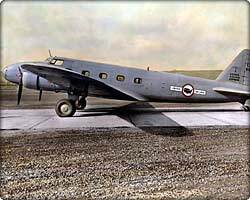 The crew spent the next nine hours regaining control and making emergency repairs midair and returning to Lakehurst early the next morning. In response to this incident, the USN changed to shorter masts with breakaway mounts. On September 2, 1925, USS Shenandoah departed Lakehurst for St Louis, the first leg of a midwestern promotional tour. Early the next morning, over southeastern Ohio, the ship encountered violently shifting lateral winds amid a strong updraft. The crew could not control the ship, which rose until decreased external pressure ruptured a gas cell, causing a brief rapid dive until the updraft lifted the ship again, repeating the process several times until the ship broke apart. While the bulk of the ship came down at once, the bow remained aloft, and crewmen there were able to later bring it down like a simple balloon. USS Los Angeles over Manhattan; date uncertain. Launched in 1924, USS Los Angeles was the only USN rigid airship to be formally decommissioned, in 1932. On August 25th, 1927, while moored at the mast in Lakehurst, USS Los Angeles was pushed to eighty-five degrees from horizontal. There were no injuries to the crew, and minimal damage to the ship. This was the nearest USS Los Angeles ever came to disaster. It flew longer and farther than all other USN rigid airships combined, and never caused even a single death or serious injury. Perhaps not coincidentally, it had been built in Germany. Launched in 1931, USS Akron was first damaged by wind in February, 1932, coming out of the hangar at Lakehurst. A tail fin was smashed, and some landing-rope fittings torn loose. On May 11, 1932, during a failed landing attempt at an underequiped and inadequately staffed field, two men were killed and another injured after the mooring line severed. They held onto their ropes, and were carried up with the ship as the wind took it away. A fourth man who hadn’t released his rope had the presence of mind to secure himself to his rope, and wait there until the crew pulled him aboard. Just after midnight, April 4, 1934, USS Akron encountered a violent storm east of Atlantic City, New Jersey, and was blown tail-first into the sea. 73 of the 76 men aboard were killed. Launched in 1933, USS Macon successfully demonstrated the usefulness of an airship, when operating with small fixed-wing aircraft and a surface task force, in performing recon, but also highlighted the vulnerability of airships in these same circumstances. Lessons learned from Shenandoah’s misfortunes had been applied to the Macon’s design, as well as its operations, but it, too, was caught in a storm, off Point Sur, California, on February 12, 1935, and was brought down by it. By this time, life boats and life jackets were standard equipment on USN airships, and only two of the crew were lost. A trip to New York on Hydrogen Wings. It Was Just One of Those Things. After the stunning success of our first guest post, I am happy to announce our second, which is also amazing, but in a very different way. Today’s blogger, Stacy Danielle Stephens is most certainly a polymath in the traditional sense of the word. Not only is she the owner of Flatwater Press in Nebraska, which puts out classics in affordable editions, but she is also an author in her own right, having written The Nothing That Is and Other Stories, The Bohemian Girl and Other Stories, When So Much Is Left Undone and Other Stories, But Soon It Will Be Night, and Daybreak in Alabama. As if that wasn’t enough, she is also extremely knowledgeable about WWII and the immediate prewar era. And that, of course, means airships. Because, as steampunk writers never tire of telling us, there is nothing more awesome than airships. Enjoy! In 1936, a passenger boarded The Hindenburg, then went to her room to rest before takeoff. After some time had passed, she began to wonder what the delay was, and rang for a steward. When he arrived, she asked when they’d be taking off. He told her they’d taken off over an hour earlier. This illustrates two things. 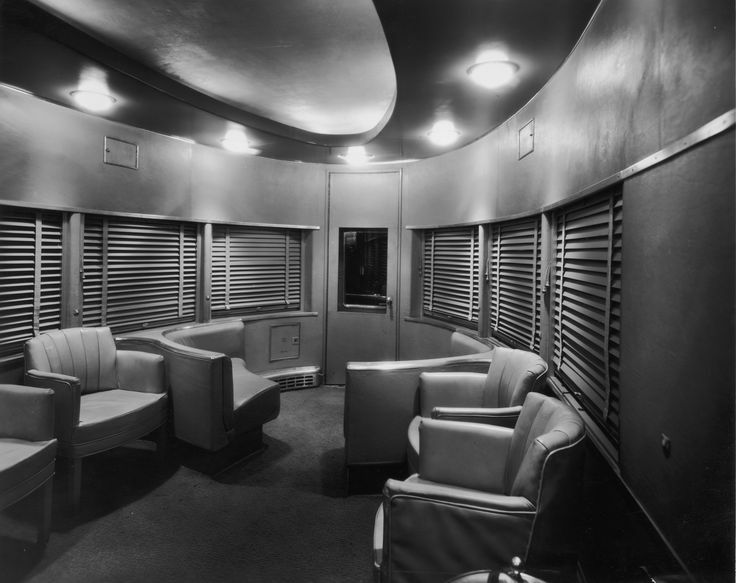 Traveling in The Hindenburg was unbelievably placid. If you weren’t watching the ground passing beneath you, you probably didn’t know you were moving. The other thing? You couldn’t watch the ground from your room, because it had no windows. 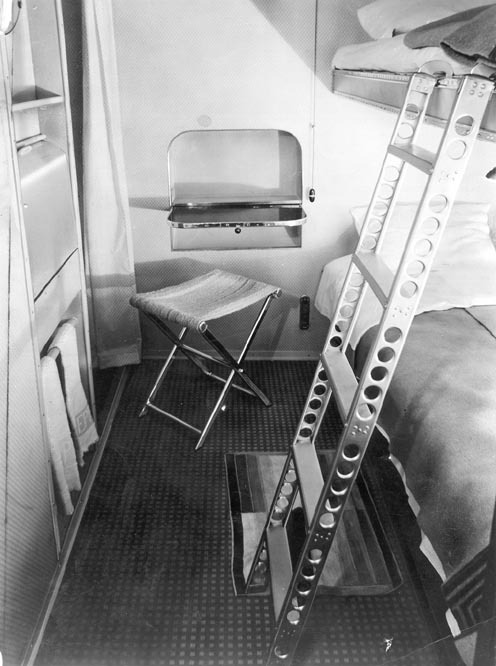 A passenger cabin of The Hindenburg was actually smaller than a Pullman car for railroad passengers. But the Hindenburg passengers didn’t mind this. 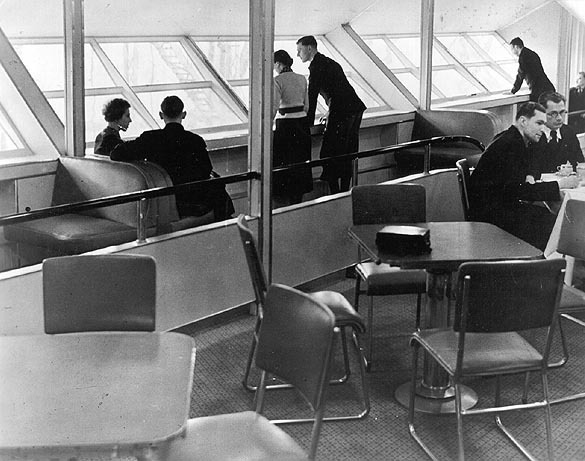 They spent most of their time on the promenade deck (below), where they could watch the landscape, in much the way rail passengers in the observation car might, except on The Hindenburg, you watched from above, with just enough altitude for the the view to be dramatically panoramic, yet highly visible. The Hindenburg operated at low altitudes not just to offer this fabulous scenery, but for the safety of it. Atmospheric pressure decreases with altitude, and this caused the potentially explosive hydrogen inside to strain at its containment cells. It would be vented as necessary to prevent damage, but also to compensate for the loss of fuel as it travelled. And from this lower altitude, the Hindenburg crew was also better able to watch the weather as they approached it, and would not only avoid storms, but even take advantage of them, maneuvering the ship into a useful tailwind whenever and wherever they found it. The passengers were seldom aware of this, or of the fact that the elevator man was essentially strong-arming the ship’s stabilizers to keep it within five degrees of level, which is another reason passengers seldom felt any sense of movement. An eight-degree tilt is enough for heavy objects to slide off of a smooth surface, and in household plumbing, drainpipes are set to a four degree slope to ensure that waste water flows easily but quietly. In 1936, passage on The Hindenburg, between Germany and the US, cost $400; converted to today’s dollars, that would be between five thousand and six thousand, depending on how the conversion is calculated. For comparison, first class passage on a fast boat was $240. 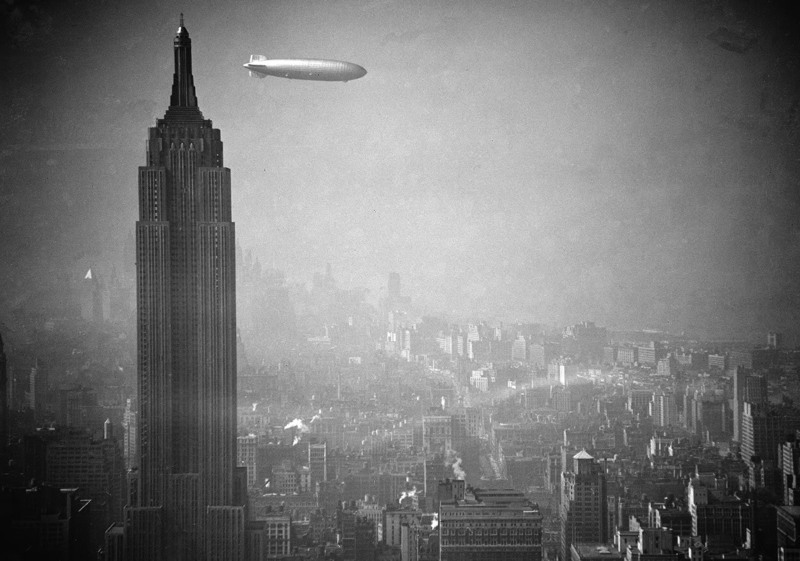 The Hindenburg would make the crossing in no more than three days; its fastest crossing was forty-three hours. A fast boat would take five or six days. For people who could afford it, getting there in half the time was worth paying nearly twice as much, particularly when comfort was only slightly compromised, and any risk of seasickness done away with. 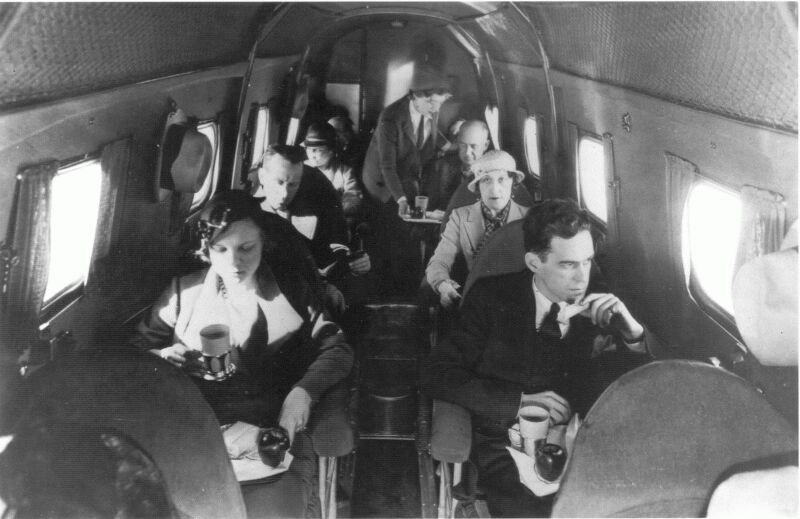 For further comparison, the standard of transcontinental fixed-wing air travel in the thirties was set by United Air Lines Boeing 247. For $160, United would take you from New York to San Francisco in twenty hours, with five to eight stops along the way. In those same twenty hours, for still more comparison, the Twentieth Century Limited would take you from New York to Chicago for $52. 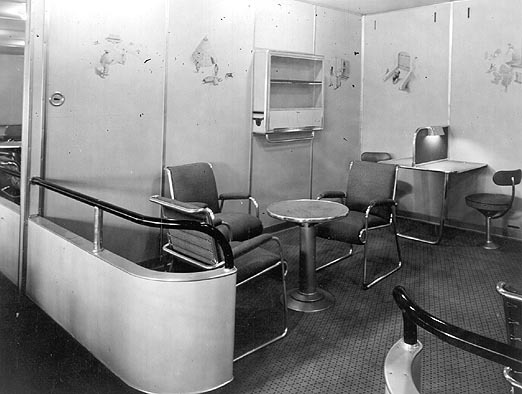 Now contrast The Hindenburg’s reading room (below left) with the 247’s interior (below middle) and the 20th Century Limited‘s observation car. I have yet to write the passage of my War Correspondent novel in which a woman who travelled on The Hindenburg wistfully recalls the absolute wonder of it some twenty years later. If you don’t want to wait, you might want to visit The Zeppelin Museum in Friedrichshafen, Germany, and see the Hindenburg replica there.